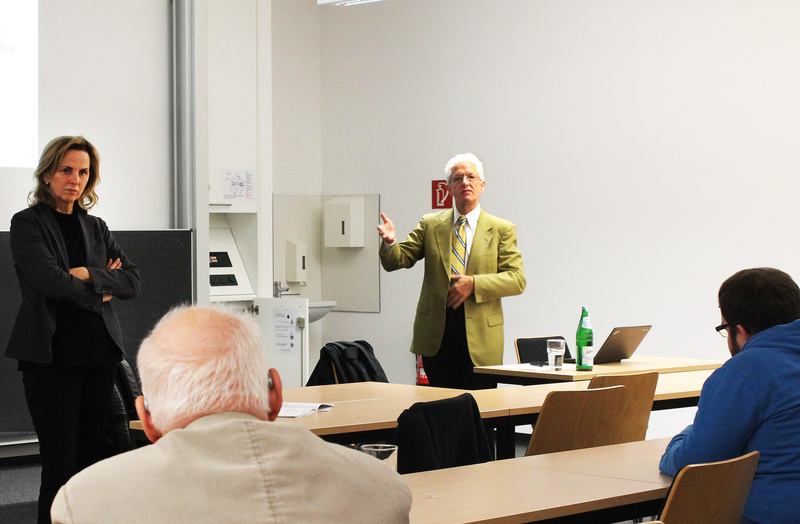 On the 24th of October, Prof Dr Barry Smith (University of Buffalo) gave a lecture on the subject “Digital Environments” at Paderborn University within the lecture series EcoTechGender. The Teaching and Research Area EcoTechGender, headed by Prof Dr Ruth Hagengruber, deals with the philosophical analysis of the connection between economy, technology, and gender. In his given example, Prof Dr Barry Smith depicted the interaction of man and his digital environments. His starting point is the Aristotelian concept that objects in one’s surroundings can be separated into matter and accident, in which the specific characteristics of an object ask certain “affordances” of people. These are requests that trigger certain actions in people, which are pre-established by an evolutionary and cultural frame. Up to a few decades ago, these actions sank into oblivion. This is a stark contrast to the modern age, in which the constant retention and saving of large data sets is possible. Here, the actions of people are preserved and new digital environments are created, which, in turn, address new “affordances”. With this, qualitatively different actions are provoked in people, which are located at the interface of the real and the digital world, without which the accumulation of data and its evaluation would not be possible. Prof Dr Barry Smith is the Julian Park distinguished Professor of Philosophy and an adjunct Professor of biomedical informatics, computer science, and neurology. He is one of the 50 most influential living philosophers worldwide. In his research he mainly concentrates on ontology and its implementation in biomedical informatics.